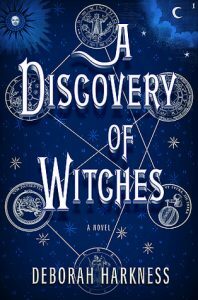 Weaving an extraordinarily rich story of magic and science, history and fiction, passion and power, secrets and truths, Harkness delivers an unforgettable and spellbinding finale that’s not to be missed. Diana and Matthew’s epic adventure proves that love, empathy and fearless determination have the true power to change everything. Undoubtedly my favorite book of the year to date! Admittedly, I began this book with a great deal of trepidation. 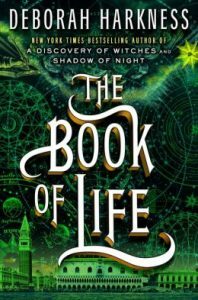 The Book of Life was my most anticipated book of the year, and this series, an all-time favorite. I had extremely high expectations for a book that would conclude an epic love story, a dangerous adventure and a riveting mystery whose secrets promised to change everything. I’m happy to say that it exceeded my hopes for it, pushing past the boundaries of what I expected with more thought-provoking, emotionally charged predicaments that evoked a deeper emotional connection with the characters and what they had to endure. 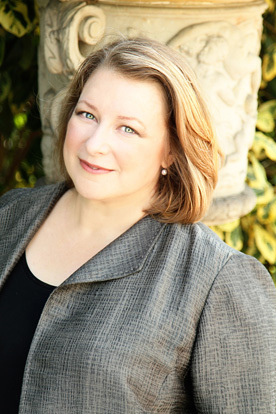 I am in awe of Deborah Harkness’ prowess in managing to infuse so much richness and dimension into her novels. Multiple characters rouse the story to life and I felt connected to every one, understanding each would have a pivotal role to play in the end. The history, the science, the academia, the magic, all woven together by flawless writing and captivating storytelling, are just some of the elements that make all three novels a one-of-a-kind reading experience. And this last book heightens all the feelings and intensifies all the conflicts they face as their adventure culminates in a gut wrenching, nail-biting, emotionally fraught ending. Returning to Sept Tours from their time in the 1590s, Diana and Matthew were reeling from a crushing loss, surrounded by a frenzy of people and enveloped by the murky shadows of uncertainty–the only certainty being the danger that loomed. They needed to find the missing pages in The Book of Life, as well as the book itself, secure Diana’s place in the de Clairmont family, protect their growing family, keep dangerous secrets buried and somehow, both avoid and appease the agitated Congregation. The issues were a heavy weight on Matthew. His restlessness grew, his control waned, the rage cresting beneath the surface. The worry for both their present and future was heavy and acute. As Matthew battles the turmoil inside, Diana is always there to assuage him. I love just how fatefully perfect they are together, understanding what the other needs at all times. Both Matthew and Diana are staunch academics, stubborn and tenacious, ready to tackle any problem head on with an arsenal of knowledge and reason, but when it comes to matters of the heart–matters of each other–there is always a softness there to calm the storms that rage within… especially for Matthew. As the mysteries they need to uncover deepen and the race to find Ashmole 782 intensifies, Matthew and Diana learn that there is still so much they don’t know. It seems there is a bevy of players, known and unknown, that seek the book. All relentless in their desire to understand the truth hidden betwixt its pages. And the more they learn, the more the need to uncover its secrets transgresses beyond mere inquisitiveness. It becomes clear that the truths veiled in the manuscript hold the answers to questions of life and death, and the fragile future of all creatures. All the conflicts they fight however, become increasingly urgent as the real and brutal terror is uncovered when the past comes back to haunt Matthew. Suddenly, past choices, whether done in error or by necessity, must be faced and conquered. The time to pay for past transgressions is inevitable, and avoidance could cost his family their lives. Matthew falls into a deep and dark abyss within himself as he battles his own fears, his past, his blood, with an unwavering sense of honor and justice always in mind. Old friends come back to help tackle the problem and now they not only search the secrets within the elusive Ashmole 782, but also within their blood. 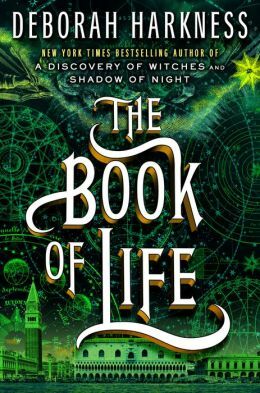 From a character perspective, I felt Diana truly thrived in Shadow of Night, her journey continuing to unfurl in The Book of Life, but for Matthew, what he had to face in this final installment was staggering. He had to understand himself, accept the truths than coursed through his veins, conquer so many of his demons, and allow himself to be loved and supported by others. I found Matthew’s evolution truly fascinating. His love for his family, for Diana, make him incredibly vulnerable, yet he has this immovable and awe-inspiring fortitude. My heart ached for him along the way. Matthew needed his family, his home, Diana, to put the past behind him and put it all to an end. There are so many wonderful surprises in this book, so many unexpected turns. Several moments felt laden with so many emotions that they brought tears to my eyes. There were also moments I found so heartbreaking and gut wrenching to get through. The kind that caused me visceral pain because they happened to people I cared deeply about. But frankly, it was the beautiful moments of love and happiness, and even the ordinary moments where Diana and Matthew returned to solely being two scholars debating alchemy or genetics or history, that my heart felt truly full. As much as I discussed Matthew’s personal journey above, Diana’s evolution comes to an impressive climax as well. She becomes one with the truths that flow within her, unleashing her power, her love, and finally, her fearlessness, to protect the ones she loved the most. One of the things that makes this story so special to me, is that there’s a strong message of learning to understand and accept one another as they are. The sense of empathy, coupled with the power of love, has the capacity to heal, fortify and change lives. Matthew and Diana were surrounded by people who loved them fiercely, who were willing to lay their lives on the line for them, and for the future of all creatures… I couldn’t have loved these people more. Gallowglass, Ysabeau, Marcus, Miriam, Sarah and others who will remain a secret for now, added so much richness to this unforgettable story. Magic and science, history and fiction, suspense and mystery, love and forgiveness. This series has everything I endeavor to find in a book. It’s richness and depth is incomparable to anything I’ve ever read and I’ve loved every moment of my experience reading these three novels. Click on image to purchase from Amazon U.S.